It has been a busy summer here in Kelowna. We had lots of family and friends visiting us! Also busy with my summer work. I did play some golf but did not play that well. My index went up to 10.9! There is snow in the hills here. I am excited for the ski season! There is nothing like sliding on snow and ice. I love it! I hope you all had a great summer and were active! Being strong always gives you an advantage! 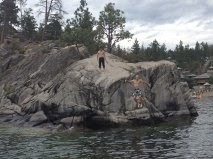 Takumi and I cliff jumping in Okanagan lake. 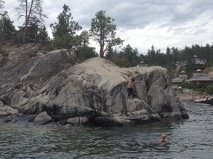 We did not see the Ogopogo monster!